If you have played my Lands of Dream games, you will have noticed a wide variety of non-game influences: the poetry of William Blake, the short stories of Lord Dunsany and H.P. Lovecraft, postcolonial theory, ancient Greek philosophy, world mythology, contemporary politics, and so on. It makes sense, of course, since in the Lands of Dream everything ever imagined is real, even postcolonial theory (hah). But one of the strongest of all influences, one of the most basic building blocks of these games, is the Quest for Glory series by Lori and Corey Cole. The first Quest for Glory game I ever played was Quest for Glory IV: Shadows of Darkness (1994). I didn’t even have a computer of my own at the time, but my friend Stelios did, so we played it together on his (well, technically his father’s) Intel 80486. I think we only understood about half of the text and pretty much nothing about how to win, but it was completely spellbinding. The atmosphere was powerful, the characters were memorable, and the adventure/RPG hybrid gameplay made anything seem possible. The land of Mordavia was eerie, beautiful and often terrifying – especially at night, when the really nasty monsters came out. The game informed us that it had been designed by Lori & Corey Cole and that the other games in the series were called So You Want To Be A Hero (1989), Trial by Fire (1990) and Wages of War (1992). We never finished the game, but it made a huge impression on me; so a few years later, when I had a PC of my own, I got my hands on the entire series up to that point in the form of the Quest for Glory Anthology. And that’s when my journey through Gloriana really began. And what a journey it was! From humble beginnings in Spielburg through increasingly grand adventures in Shapeir and Fricana to the dark lands of Mordavia that I’d visited before, it was a stunning series of adventures through mythologically-inspired settings. And since the games allowed you to import your character from one game to the next, it really did feel like one long journey. But there’s more to the genius of the Quest for Glory games than that. After all, what I’ve just described could be any generic fantasy series with settings inspired by real-world mythologies. And the Quest for Glory games are anything but generic. For one thing, there’s the gameplay. When the game begins, you get to choose a character class (Magic User, Thief, Fighter) and assign skill points, and this RPG element makes a huge difference. Almost every puzzle can be solved in multiple ways, and there are whole chunks of story that are entirely specific to your type of character. I’ve yet to see any “proper” RPG that makes your choice of character class feel this significant. It feels great to be a thief and have access to the secret Thieves’ Guild, or to be a magic user and be able to get a desired object from a hard-to-reach spot simply by casting Fetch. And even better than that is the fact that you can become a Paladin, a character class only available within the course of the game itself (in Trial by Fire), and that this really means something in terms of the good you can do in the world. The latter is only possible because there is a world to care about. Yes, the Quest for Glory games are full of humour – at times very, very silly humour. But the majority of the people you meet are not jokes; they are not quest-givers with big exclamation marks over their heads, essentially indistinguishable from GUI elements. The characters in these games have that most elusive of qualities – grace. They are people, not gameplay functions. Even one of the major villains of the series movingly turns out to be a far more complex individual than you would expect. Silliness, beauty and heartbreak all co-exist in the Quest for Glory universe, as they do in ours. And so you care. You want to be a hero not for your own selfish reasons, but because you want to help. You play a Paladin not because you want the +100 Sword of Powergaming, but because it will allow you to put a tormented soul to rest. It’s a great feeling and a significant accomplishment. 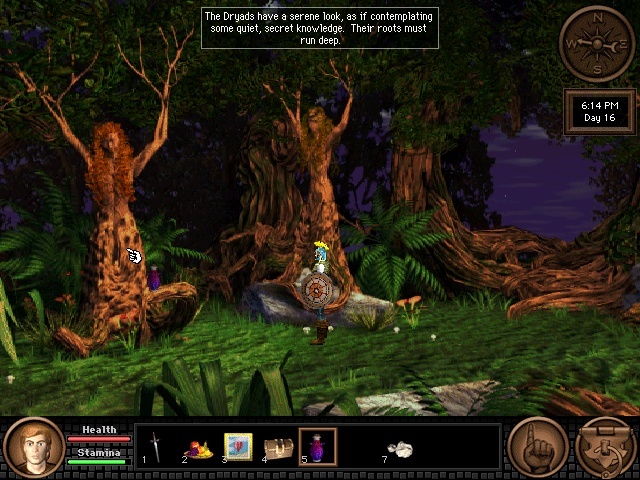 Another element that unifies and strengthens the experience of playing the Quest for Glory games is that the later games aren’t so much sequels as simply chapters of a larger story; unlike most series, Quest for Glory was planned from the beginning, with the third game being inserted for storytelling reasons. This gives the games a sense of coherence and reality that is rare in this medium. (This is also a main characteristic of another one of my major influences, Babylon 5. I like it when writers know where they’re going.) It also means that reoccuring characters start to feel like old friends. When you meet some of them again in the last game, after having been separated from them in Shadows of Darkness, you experience genuine joy. Speaking of the last game, Dragon Fire was published in 1998 after a vocal campaign by fans pretty much forced Sierra not to abandon the series without a finale. It’s a little different from the first four games, especially in that the RPG and action elements are a tad more pronounced, but I think it’s a lovely game. The Graeco-Roman atmosphere, the incredible score by Chance Thomas, the sheer plesasure of exploring the island of Marete… it might actually be my favourite of the series, even though the story in Shadows of Darkness is more moving. Nah, I can’t really decide. They’re both brilliant. The entire series is brilliant. There you go. I’m sure that those of you who know my games can see some of the similarities. The RPG elements are missing (I’m keeping them for another game), but the rest should be familiar. People and places that you can care about; stories in which villains aren’t always villains; planned interconnections between the games; silliness and seriousness co-existing, not seen as negations of each other; a love of mythological themes; attention to detail… and of course an abundance of absolutely terrible puns. That is not to say that the Lands of Dream games are “tribute” games or that I was trying to recreate Quest for Glory. Lori and Corey Cole showed me what was possible, and I took off from there and went on a journey of my own. Well, not entirely of my own! Because I, too, have a co-designer. She didn’t play Quest for Glory growing up (she played Companions of Xanth), but the fact that all these years later, Jonas & Verena Kyratzes are making games that people love in the same way that I loved Quest for Glory is simply amazing. I started writing this before the Coles put up their Kickstarter for a new game, Hero-U: Rogue to Redemption. Unlike many Kickstarter projects, this isn’t just a thinly-disguised remake or appeal to nostalgia, but an original game. If you have some money you’d like to invest in a crowdfunded project, you should strongly consider investing it here. I really want to see what these personal heroes of mine can come up with without a publisher breathing down their necks. I suspect it will be glorious. I grabbed the screenshots from the net. Hope no-one minds. There’s a fantastic authorized remake of Trial by Fire. The way Quest for Glory handles day/night still puts modern games to shame. I tried to avoid spoilers. Go get the games from GOG. Experience the story yourself. Really, do support that Kickstarter. And, you know, totally buy The Sea Will Claim Everything. Thanks for the article, Jonas! Shadows of Darkness is brilliant (sort of pun? ), and is the most terrifying non-horror game I ever played, especially the night in the woods and Rusalka quest when you are playing the Paladin. The Rusalka quest was amazing. And being out in the dark is terrifying in most of the QfG games, but especially horrific in Shadows of Darkness.